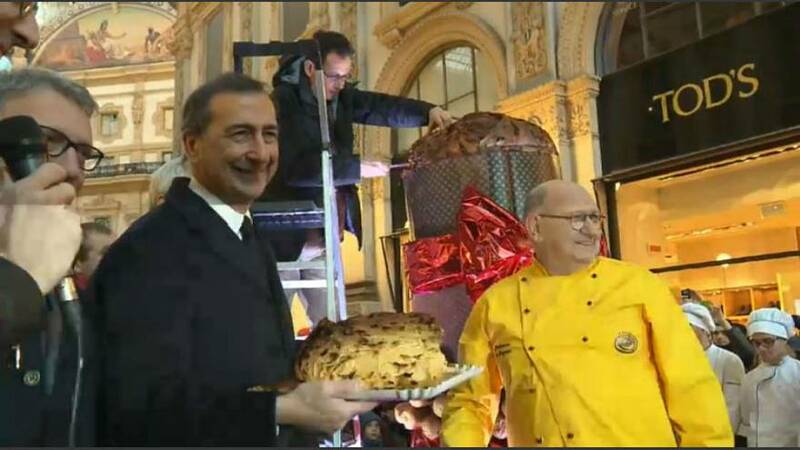 The world's biggest ever panettone has been sliced up and offered to the public in Milan. It stood at two metres high and weighed in at 140 kg, producing 1,200 slices. The giant cake used 69 kg of flour, 28 litres of water, and 27 kg of butter. The bakers of the towering panettone are not the first to find themselves driven to excess during the festive season. In the UK, the world record for the largest ever mince pie was set on 15 October, 1932 in Ashby-de-la-Zouch in Leicestershire. It measured 6.1 metres by 1.5 metres and weighed 1.02 tonnes. Also in the UK, in Aughton, Lancashire, the world's largest Christmas pudding went on view in 1992, weighing in at nearly 3,300 kg. It may be a quintessentially French tradition, but the world's longest yule log was baked in China, at the Shangri-La Hotel in Shanghai on 1 December 2011. It was 1,068 metres long. Texans took the German tradition of eating spiced biscuits at Christmas time and supersized it. The world's largest gingerbread house was built in 2013. It was 6.7 metres in length, was decorated by more than 23,000 sweets and packed a whopping 36,000,000 calories.